We have two forms that allow users to submit files to a dropbox folder. Mid week, we stopped recieving notifications that someone has submitted a form. Should I look for a solution to this problem on your end or go to dropbox? 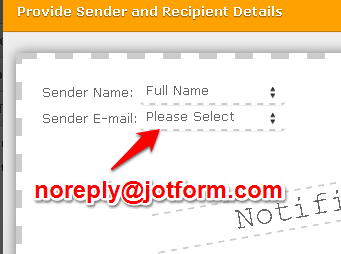 While checking the notification settings of your form I found that the Sender Email field is not setup to noreply@jotform.com. - Go to Setup and Embed tab in the toolbar. Then go to Email Alerts then Choose a notification. -Then click on Reply-To and Recipients Settings. And Finally choose noreply@jotform.com. If the issue still persists even after making these settings, I will recommend you to whitelist our domain names. I also suggest you to take in account the directions in the net guide at the time of creating a notification in your form: How to create email alerts to prevent email bouncing realted issues.